School was closed due to the haze on friday, had a good long weekend, caught up a little on my sleep, yay. My boys are hoping the haze will be back again today so that they don't have to go to school tomorrow. After checking the pollutant index a couple of times since this afternoon, they are finally convinced it's not going to happen, lol. Now that they are off to bed, thought I'll finish off this post in my draft folder before I sleep. 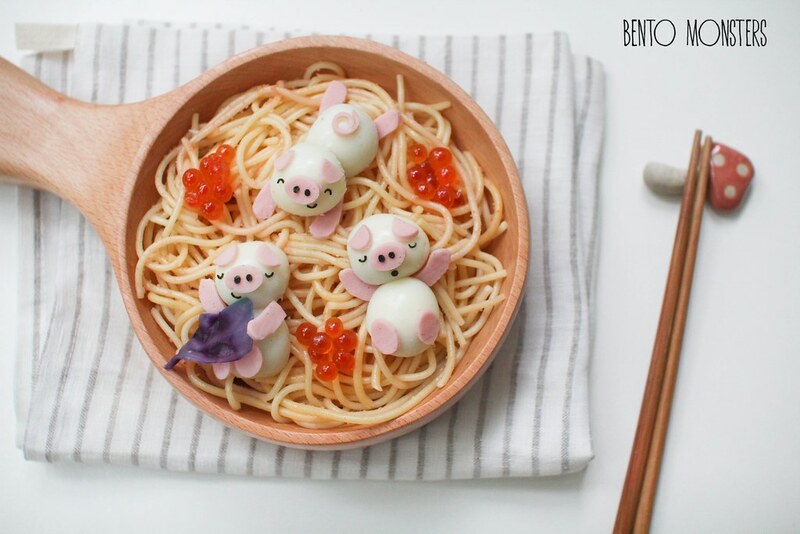 Quail eggs are a quick way to decorate your food, you can make them into various animals and even some cartoon characters. 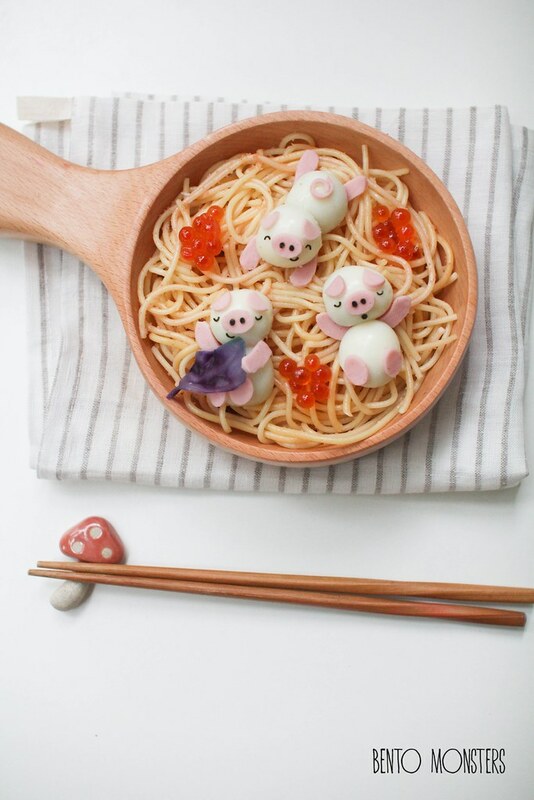 One of my favourite thing to make out of quail eggs are piggies. One quail egg makes one piggy, I cut the quail egg in half, that way I won't end up with too many quail eggs in the bowl. The pink portion is Japanese fish sausage, you can substitute with ham if you can't find it. The blanky one of the piggy is holding is a blanch red cabbage. 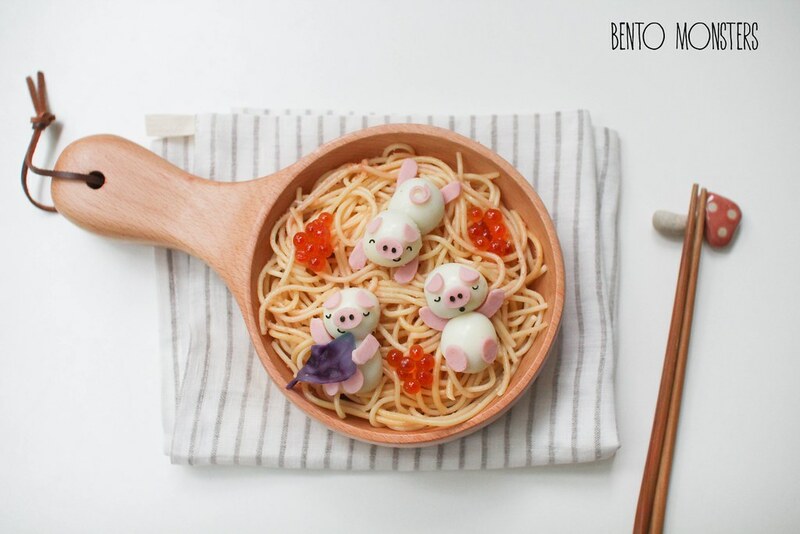 The piggies are lying on Mentaiko pasta, one of our favourite Japanese fusion pasta. 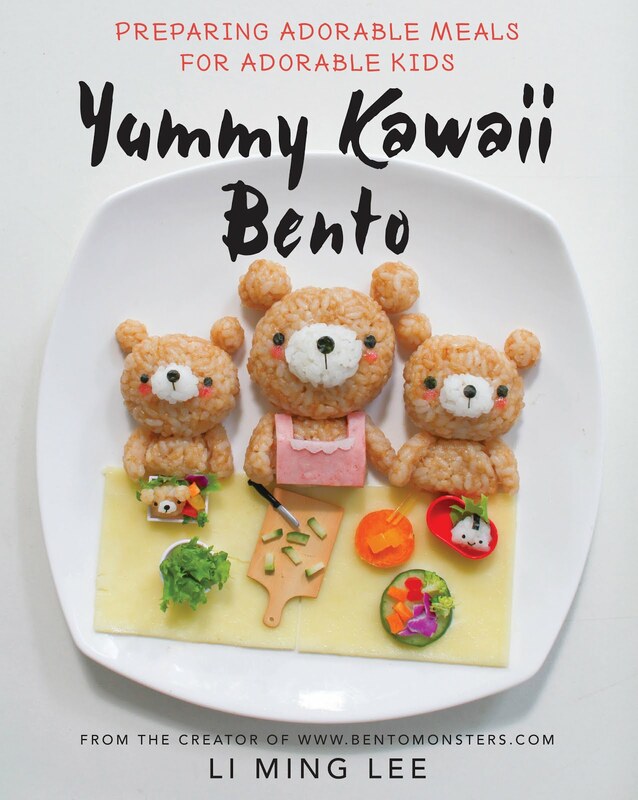 I've shared the recipe here on my blog before. I've also added some Ikura, which my boys like as well. Another version of quail egg piggy, this time I soaked the egg in beetroot water to get the nice pink colour. I also made a quail egg cow. The extra cutouts for their nose and ears were actually sliced out from the back of the quail egg, which means that the back part is actually not presentable, lol. This time, the animals were lying on pasta bolognese, added in asparagus, carrots and lettuce to make it a more complete meal. Served the meal with some infused water which IT likes, but LT hates. LT says he prefers plain water, no lemons in his please. 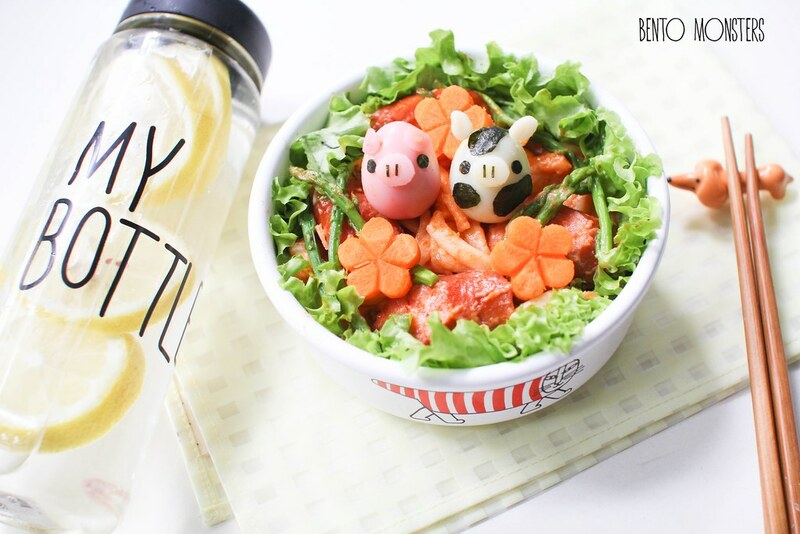 Those little piggies are just so darn cute! 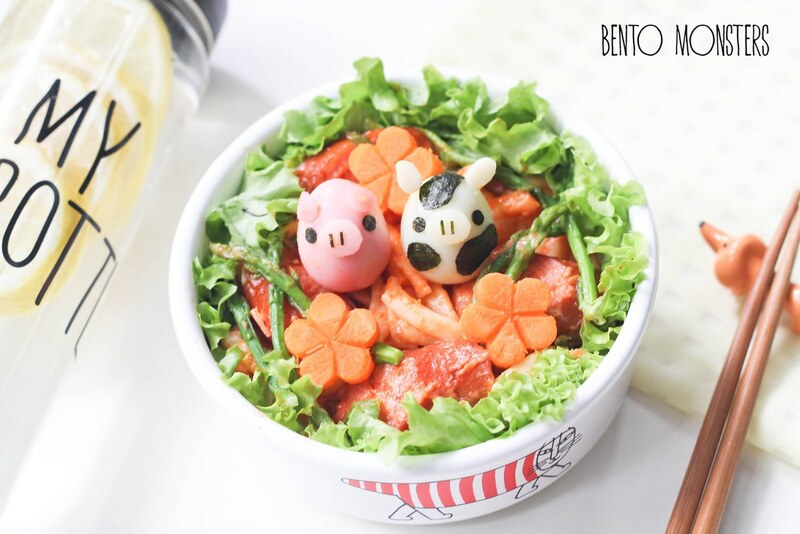 Your bentos are amazing. Tk u, Beth, you site is amazing! The piggies are so cute and the color of the other pig turned out fantastic! I love how you use natural coloring for your foods! 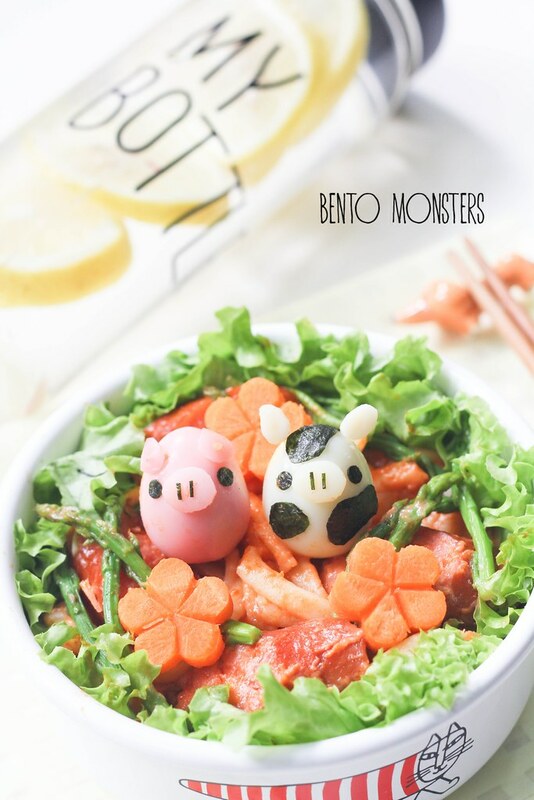 Your quail eggs all turned out so kawaii!